Avn Sturm’s dissertation interest is in Ayurveda, with a focus on the doctor-patient healing relationship in Ayurvedic Medicine. Ayruveda is the traditional medicine of India, based originally in the second millennium BCE, and further developed in the millennia since that time. Ayruvedic Medicine treats the whole person, not the disease, and draws heavily on herbs, dietary change, meditation, and life style changes, to draw on the healing resources of the patient. 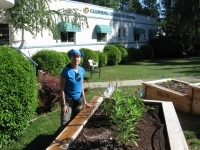 For Avn Sturm’s clinical practicum she chose to learn more about Ayurveda at the California College of Ayurveda (CCA) located in Nevada City, California. For her preparation, she chose to go to the school a few days early during the May 2011 Residential Conference in San Francisco to meet Dr. Marc Halpern, founder and director of CCA. Together, Avn and Dr. Halpern discussed her goals for her practicum, and during this visit she had time to acquaint herself with the school and community. Avn continued her relationship with Dr. Halpern by periodically emailing him. She felt that forming a stronger relationship came in handy when the scheduling for her practicum shifted from Spring 2012 to Summer 2012. She concluded that flexibility and patience were essential in assuring a positive practicum experience. During the practicum Avn actively engaged with the philosophy and psychology of Ayurveda and left the placement with copious notes for future reference. She was given the opportunity to experience Ayurveda in a tactile sense. Avn rolled up her sleeves and actively engaged with gardening equipment, learning how to skillfully attend to the healing plants (such as Oregon grape root, the Ashwaganda plant, and others), which are part of the ancient tradition of Ayurveda. In addition to tending to plant life, she spent time in the kitchen with Ayurvedic practitioners mindfully hovering over the process of creating medicine (“churnas” which are mixtures, medicinal teas, and “basti” for internal cleaning) made to aid others. Avn’s clinical practice experience left her with images that she will carry on in her lifelong work. The practicum allowed Avn to be a part of the healing relationship, to see what it looked like and how it felt to be in this community of scholar/healers in Ayurvedic Medicine.